A trio of new promotional images for The Walking Dead's seventh season have been released and they're bringing Rick to his knees. The new images, featured in the gallery at the bottom of the page tease changes coming to the series with text such as, "The Next World" and "The Price Will Be Paid." Of course, the images are not new looks at the characters. Rick was seen brought down to his knees in the season six finale upon Negan's arrival and the images of Negan are consistent with looks from the same episode and season 7 trailer. Negan will be doing a lot more than bringing Rick to his knees when the AMC series returns next month. 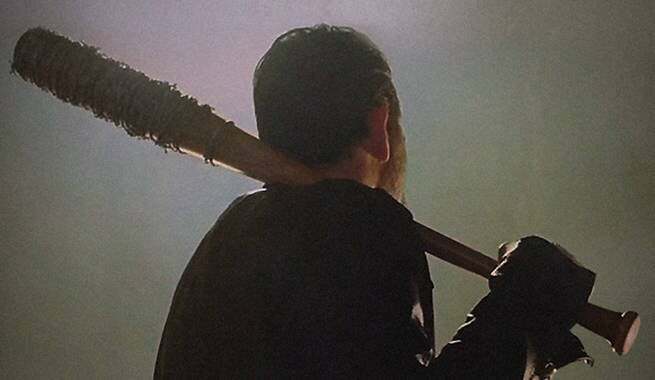 Following his brutal kill which will kick off the new set of episodes, Negan will have control over Alexandria and Rick's group like nothing we have ever seen before. Comic book fans have an idea of what to expect, though. "Some of the incoming directors, when they come in, they read all the scripts," executive producer Greg Nicotero tells ComicBook.com. "As the cuts are available, we want them to see the show because we want them to get a flavor for what we're doing visually. A couple of people have seen [the premiere] and then they stand next to me for about 24 hours going, 'F---!' And I'm like, 'What?'" Check out the three new posters for The Walking Dead's seventh season in the gallery below. The Walking Dead returns October 23, airing Sundays at 9 PM ET on AMC.